I spent almost the entire day yesterday making pasta for the freezer. I started with four batches of extruded pasta using the fusilli die on my pasta extruder. We like this shape because it has lots of grooves and somewhat resembles a spiral pasta. 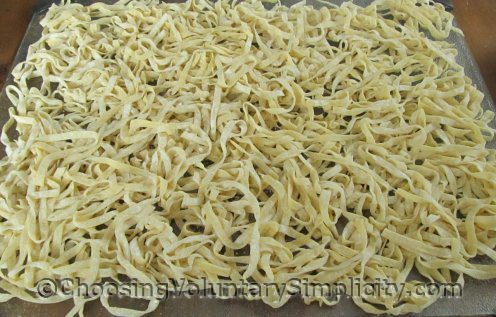 Next I moved on to making four batches of egg noodles. For these I use my hand-cranked traditional style pasta machine and the widest setting on the cutting blade. And finally… ravioli. 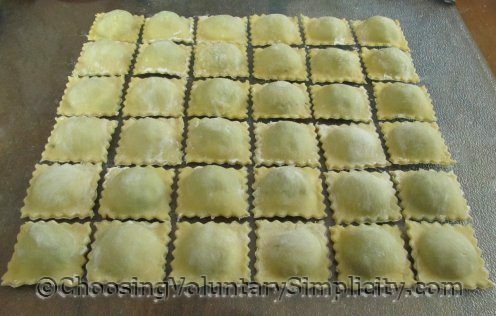 I had already made up four batches of dough for the ravioli… AND the filling… so I really had to follow through… but by the time I was done with these, I was past ready to stop making pasta. 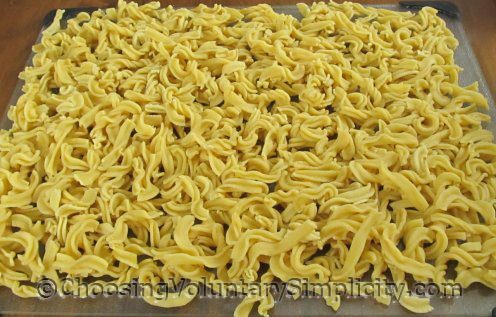 I make the pasta and noodles for the freezer on a regular basis and freeze them in meal-sized portions. I don’t make the ravioli as often and I forget what a time-consuming process it is. The next time I get the bright idea of making all three at once, I hope I remember that… even with my wonderful handy-dandy one-purpose kitchen gadgets :o) … making four batches of pasta and four batches of noodles is really more than enough for one day… and that it isn’t such a great idea to add making another four batches of ravioli on top of that! Wow!!! I’ve never been brave enough to tackle more than one type of pasta in a day! I salute you! They’re all beautiful! I’m wondering how you get the ravioli to be such perfect even squares. I even use a ruler when I cut mine but they’re all over the place in size. They taste great but don’t look so pretty. I use an inexpensive two-piece ravioli maker/press almost exactly like this one. It really speeds up the process and makes everything uniform.